Fire can be devastating, but the effects of a fire related incident at a business premises, can cause major disruption for the business long after the fire itself. Whilst the application of some common sense fire precautions can assist in minimising the likelihood of fires, employers have legal responsibilities too. There are various regulations and requirements placed on businesses and business managers, amongst them are The Licensing Act 2003, The Fire Precautions (Workplace) Regulations 1997 as amended by The Fire Precautions (Workplace) (Amendment) Regulations 1999, The Health and Safety at Work etc Act 1974, The Management of Health and Safety at Work Regulations 1999 and The Regulatory Reform (Fire Safety) Order 2005. These acts and regulations all relate to the issue of fire and the safety of people in fire-related incidents. They place a legal requirement on business managers/owners to ensure the safety of staff and visitors alike. Non-compliance with the above regulations is a criminal offence and carries penalties of a £5,000 fine, 6 months imprisonment, or both. In the event of a death, charges could extend to manslaughter for any breach of sections 2 to 6 of the Health and Safety at Work Act etc, so it is understandable that there is very high level of concern about fire safety. The majority of regulations require employers to undertake risk assessment that takes into consideration the risks to people who can reasonably be expected to come into contact with the workplace or activities associated with it. Measures must be reviewed along with the whole risk assessment upon significant change or at pre-specified regular periods. Is Your Upholstered Furniture Fireproofing Protected? 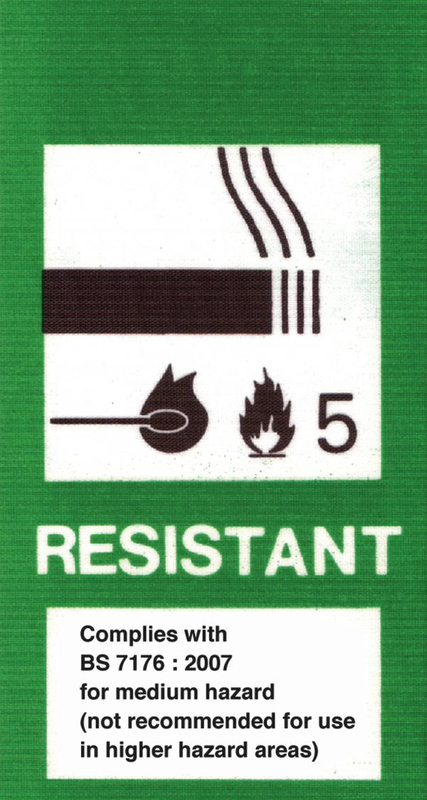 Upholstered furniture is pre-treated and bears a permanent label as flame protected, yet many do not meet the recommended BS 7177 / BS 7176:2007 is a specification which describes four different hazard levels for contract furniture and describes appropriate tests for evaluating furniture materials. Cleaning fibres and fabrics can have influence on their fire resistance. This is because any chemical treatment used to make the items fire-resistant may be washed out during dry-cleaning and other cleaning methods which could lose its ability to resist a flame and these need to be RE-TREATED. FRS100 Flame Retardant will protect mattress, curtains, carpets, blinds, artificial plants etc. and is ideal for use in theatres, hotels, schools, residential homes, village halls, pubs, bars and any public areas where flame retarding is required. Soil and stain protection treatments. British Standards: FRS100 flame retardant spray complies with relevant British standard fire test BS5852 & BS5867. If you require more information on the Fireproofing Service, you can contact one of our representatives on 0115 942 0028.